So where will weddings take place next? Who would have ever thought that McDonald's would be in the wedding business? I've heard of couples hosting weddings in a backyard, old barn, vineyard, catering hall, field, beach, top of a mountain, park, and so on, however, with couples tying the knot in Home Depot, Target and other out of the way places why not have your wedding reception at McDonalds? Well, people in Hong Kong can now have McWeddings, a McDonald's wedding. 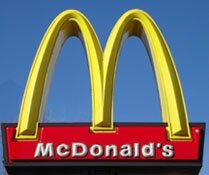 As of January 1, 2011 McDonalds offered McWeddings packages including McDonald's food, pink invitation cards with the Golden Arches, a baked apple pie wedding cake, a dress made out of party balloons and kiddie party favors for guests. The cost in Hong Kong dollars is equivalent to $128 US dollars with the actual cost depending upon what your guests order. The first formal ceremony (imagine saying your vows under the Golden Arch's) took place on Valentine's Day in downtown Hong Kong near the financial district. 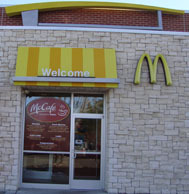 Many couples meet, have dates and fall in love in the fast food chain so the concept of marrying with hamburgers and fries is considered OK.
Mickey D's reception will not permit alcohol, since the fast food restaurant wants to ensure that the guests don't get inebriated and act inappropriately in their family restaurant. So who needs a drink when you can toast with a premium iced coffee? McDonald's in Hong Kong is not closing the restaurant to other patrons while your reception is taking place, so you will have many onlookers and well wishers who could also be party crashers or party delights! If you're not into spending a lot of money on your wedding and having a McDonald Wedding excites you, go to your nearest Mickey D's and talk to the Manager about hosting your wedding there. Questions to ask about having McDonalds Weddings McWedding. Will the restaurant close for a set period of time? You probably would prefer not to have passerby's drop in on your nuptials. Is it permissible to have your wedding ceremony on the grounds? Can you bring in a D.J. or other music if you would like to have dancing? Where will you be able to dance? Will guests be permitted to order anything off the menu or will the choices be limited? If the restaurant is closed to outside patrons can you bring in alcoholic beverages? Can you do your own decorating and how much before your wedding can you put up your decorations? What is the minimum and maximum number of guests that the restaurant will accommodate? Will there be ample parking for your guests? Will they provide a manager to oversee your reception? Economically minded couples are becoming more creative, so if McDonalds Weddings McWeddings interest you, check it out. For your edification on 2/20/2011 I contacted McDonald's in Hazlet, NJ and was told they have no plans (at this time) to host weddings. I also asked if any information was available from their corporate headquarters and was told that no plans were in the works at this time. I called McDonald's headquarters in the U. S. and they confirmed that they still do not have plans to host weddings in the United States. Please review my reception links below for more information on wedding ideas. Want more bridal ideas? Visit my home page.